Sustainability: Realizing Supply Chain Leadership through Coll.. Innovation projects are said to fail 90% of the time. Why is this? Part of the answer lies in the special “innovation teams” who are mandated with finding breakthrough growth in large corporations. Setting these teams up for success is vital, yet corporations often fail when doing this. This article provides a collection of ten tips that serve as a talent management roadmap for growth companies in search of high-performance teams that deliver. After interviewing a series of successful growth leaders, entrepreneurs and management gurus, we found that successful innovation teams start by selecting a diverse group who are analytical and creative in equal measures and have networks that are as broad and as deep as their skill sets. They function best within a structured environment that utilizes specialized working practices such as “safe space” and clear performance goals. Finally, the best teams are fully committed and invested in their success – mimicking the intense focus displayed by Top 10 Innovative Ideas for Start-up Entrepreneurs Success. Imagine that you’ve been asked to lead a new “innovation team” at your company. Your task is to build a team that can come up with a new revenue-generating business idea and take it all the way from concept to launch. You’ve got a serious challenge on your hands though – finding new growth beyond the core will be tough in a company that has been making the same products for decades and has a notoriously risk averse culture. On the plus side, you’ve been given a budget and the freedom to assemble your own dream team to help you on your mission. On the other hand, you don’t have a lot of time and your division president is breathing down your neck looking for results. Where do you start? 1. Start by building a bigger box rather than trying to think outside it! The first step in building the innovation team is selecting the right people. The best way to start is by understanding the actual work the team will do and then optimizing the personnel around these key activities. Commonly included in the work of an innovation team is a creative phase to generate new business ideas, an analytical phase to understand their business potential and a development phase to refine the most promising ideas and then test them in the market. With these activities in mind, assembling a group of people only capable of thinking “outside the box” clearly won’t be sufficient for success, as the generation of the idea is only one part of the process. We believe that a better staffing goal is to bring together a team that has the “biggest box” possible. …assembling a group of people only capable of thinking “outside the box” clearly won’t be sufficient for success, as the generation of the idea is only one part of the process. The box represents the sum of the experiences, skills, professional networks and academic knowledge that the team possesses collectively. The more diverse the backgrounds of the team are, the bigger the box they will have to draw from. Professor Jeanne Liedtka from the University of Virginia’s Darden School was among the first to make the important distinction between these two concepts in her book, The Catalyst and it applies as well to the innovation team as it does to the growth leader, which was her focus. A big box is helpful for many reasons, especially because it increases the likelihood of forming new cognitive connections between all of the team members, commonly known as the “a-ha” moments that spur great new ideas and identify undiscovered possibilities. A team with a larger box will also be more capable of addressing the various challenges and questions that come up along the course of a journey from idea generation to launch. While we believe that selecting people capable of generating fresh thinking is a given, we are surprised at how often companies err on the side of caution in this respect, bringing in a group of veterans whose deep experience of the core business can prevent them from seeing new possibilities. While we don’t advocate stocking the team full of “creatives” who are wired to generate a bucket of crazy ideas that can’t be implemented, it is unlikely that your team will come up with anything too breakthrough without sufficient diversity and a big box. The old adage of “it’s not what you know but who you know” is true for innovation teams. Every innovation team needs well-connected team members, who, with one glance at their Rolodexes (or iPhones) can find answers and call in favors, fast. 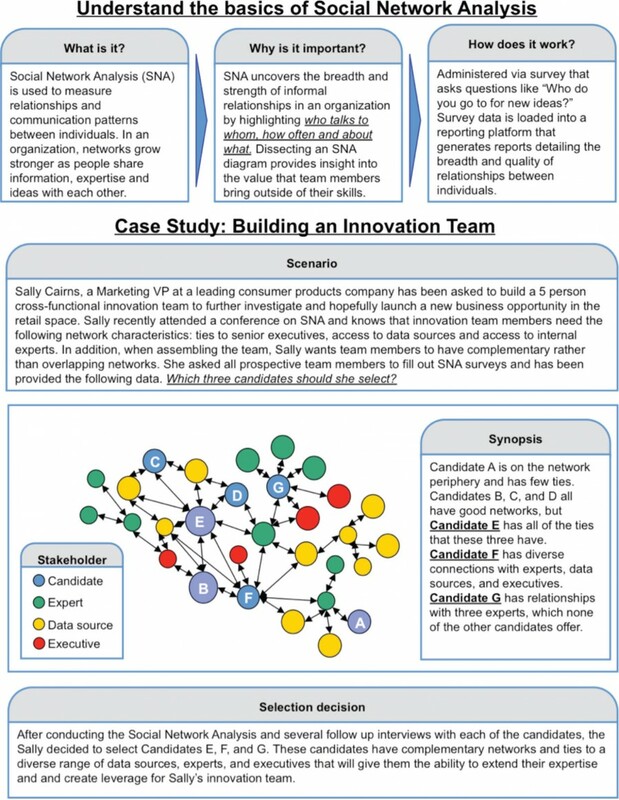 As management guru Jon Katzenbach explains, “In an innovation team, there is no way to divorce the individual innovator from his network.” Access to a strong network provides insight into a broader range of knowledge, but it also provides support. An innovation team that doesn’t take advantage of its networks will be less successful. While innovation teams usually network fairly instinctively, we believe that the quality of professional networks should be an explicit selection criteria when staffing decisions are made. In fact, modern tools have allowed mapping networks to become a much easier task (see Figure 1) and it is a wise investment of time to investigate this underrated aspect of teams before personnel selections are made. The importance of a strong network was highlighted recently during a consulting project at a large consumer goods company. When rumors spread that the team needed to supply detailed internal rate of return projections for an upcoming check-in meeting with top executives, the team panicked. Not only was there little time left before the meeting but they felt that they didn’t yet have the facts to put together such a granular analysis. On the other hand, disappointing a senior group of executives could be fatal for their project. Luckily, a member of the innovation team had a strong relationship with the VP of Finance for the division. Before the meeting, he proactively reached out to the VP and aligned on the level of analysis needed while generating enthusiasm for the team’s work to-date. Thanks to the team member’s strong network, particularly his relationship with the VP of Finance, the new business concept gained vital buy-in from the Executive team. They were granted more resources to continue developing the concept – a big win for the team. Because so much has been written about the concept of creative leadership, we instead chose to focus on how to set up the given leader for success in their role. Our research taught us several principles of leadership that are unique to innovation teams. First, having just one appointed leader on the team is optimum. While some innovation teams have experimented with leadership duos or trios, they have rarely succeeded. One entrepreneur, Tim Ogilvie who was part of a three-way leadership team at a software startup remarked, “Any innovation team that has more than one leader isn’t set up for success.” He reasoned that the key downsides are inefficient decision-making and lower morale: “Equal voting rights creates gridlock over decisions and grumpy partners!” A solo leader is free to own the vision and make final decisions, which helps him keep the process moving along fast – a vital trait in this kind of work. For the leader of the innovation team, continuing to press forward even with imperfect information is better than stalling progress while waiting for elusive data points. Interestingly, we found that while having one appointed leader is vital, multiple members of the team can and should be able to step up and take on leadership roles at times when they hold the relevant expertise at that time. Katzenbach reports that a team who is able to execute this practice has reached the status of a “real team,” – the highest level of functionality by a group of individuals. The second major principle of team leadership is that the most successful leaders are granted total autonomy over team selection. They are free to recruit the people they feel are needed on the team (hopefully with the assistance of a seasoned HR professional) and can make substitutions when changes are necessary. Being able to fire a key team member is an important aspect of team success as teams need to stay nimble and flexible, with personnel who can respond to the needs of the project at any given time. 4. Build a team that can both identify gaps in the market and markets in the gap! We all know that a good business idea usually fills a gap in the market – the idea addresses some sort of unmet need for which there is no other solution currently available. That is an important start but it isn’t enough to be considered true innovation. Innovation happens when there is not only a good idea, but also real customers willing to pay for it – that is to say, there is also a market in the gap. Surprisingly, innovation teams often neglect to bring in the skills required to ensure both of these two things happen. Being able to assess the size of a market is often the part that innovation teams find easier. Most large corporations and management consulting firms have plenty of analytical “whizzkids” capable of performing heavy lifting in Excel and sizing the likely revenue opportunities attainable for a new business concept. Often, they build bottom-up estimations of financial performance (sometimes referred to as a reverse income statement) that can either fuel further investment or be used as rationale for deprioritization. While there is no doubt of the value that financial analysts bring, this unfortunately doesn’t ensure that the idea is good to start with. It’s impossible to staff a team full of analysts and expect them to come up with anything truly innovative. To generate creative ideas and identify gaps in the market, nothing can replace the original insights gleaned through a team member trained in ethnography. An ethnographer’s role is to observe consumer behaviors and generate insights around their unmet needs – needs that typically lead to ripe innovation opportunities. Ethnographers spend time observing and interviewing consumers as they go about their daily activities, looking for pain points and understanding their motivations. Having an ethnographer on the innovation team ensures that companies don’t innovate in a vacuum – consumers and their needs become a constant grounding force behind the direction of the work. On a recent innovation project with a large financial services firm, ethnographers noticed simultaneous yet conflicting unmet needs between banks and their consumers: while consumers desired more interpersonal contact with banking tellers, banks sought to reduce costs by shutting down branches. Spotting this unmet need eventually led to the concept of a “virtual teller” system – delivered via ATMs equipped with cameras and video screens connected to outsourced tellers in remote locations. This innovative idea was a win-win for banks and their consumers and the concept has been launched in the market. 5. Find team members who tell great stories! In our experience, the ability to communicate the new business idea is almost as important as the quality of the idea itself. Whether you are presenting to your boss, your colleagues or to a panel of Venture Capitalists, it is absolutely vital that they come away with a clear understanding of the concept’s value proposition, and a shared enthusiasm to make it successful. A good storyteller can help make this a reality. Storytellers can describe problems and their solutions in a way that captivates attention and encourages action. They can help teams collaborate better and gain more support from others in the organization. In addition, it is cognitively simpler and more emotionally compelling for audiences to hear a well-explained story, versus sitting through a dull presentation of industry analysis and financial projections. Stories can be told verbally but they often have more impact if combined with visual methods such as storyboards, cartoons and movies. Modern platforms such as Facebook, YouTube, Pinterest have all emerged as modern-day story telling vehicles that highlight the potency of combining verbal and visual methods. At Microsoft’s Entertainment and Devices business unit, the design organization has spearheaded the use of visual methods and stories to present new consumer experiences. It has proven to be especially effective as a tool to communicate with the Engineers who are responsible for creating the technology that makes the new consumer experiences a reality. “They see one of our presentations and they get jazzed. Not only are they more enthusiastic, they also make less mistakes, allowing us to innovate faster,” said one Microsoft Product Manager. While we strongly believe that a diverse innovation team will achieve the best results, there is no doubt that bringing together such a wide variety of people who have different roles, thinking preferences and perspectives will lead to some interpersonal friction. These differences can lead to discomfort and even conflict, so careful attention to the team’s working processes is a vital responsibility for the team. Getting people who think very differently to work together productively ensures that the diversity can be harnessed instead of threatening to take down the entire team. Group process skills – understanding how work gets done in a group – can help and the team must develop sophisticated procedures, rules, group dynamics and interaction styles in order to do this. Cheryl Perkins, former Chief Innovation Officer at Kimberly-Clark described the difference between good and bad conflict. Good conflict or “constructive conflict,” means maximizing debate and problem solving that relates to the work itself. One form of constructive conflict is when group members challenge each other’s assumptions and hypotheses in the hope of arriving at a better answer. It is important to note, however, that constructive conflict can be over done: repetitively challenging another person is unlikely to lead to innovation. In fact, it can even be a source of bad conflict – interpersonal conflict – if disagreements about the content of the work leak over into the interpersonal realm. Bad conflict should be nipped in the bud, but constructive conflict should be encouraged. Sometimes, no matter how great the innovation team, it can help to send in an outsider. In our work, we’ve had great success bringing in external experts from outside our client’s organization to function as a knowledge resource that can inspire an organiazation to consider bold and audacious srategies. In some cases teams lacking a spark should consider hiring a wild card member, who in the words of Katzenbach, will come up with “eight crazy ideas and two really good ones.” Any interpersonal idiosyncrasies that they might bring are more than mitigated by their potential to come up with a gamechanging idea or insight. We like to refer to this role as that of the “Irritant.” This is not to say that they must in fact be an irritating person, rather that their personality and experiences are in such contrast to that of the rest of the group that their mere presence can act as a boost of energy. At a recent ideation session with a large CPG company, a senior member of the R&D organization showed up to play the role of the irritant. Unlike the rest of his colleagues who came in standard business casual dress, he wore a bright bow tie and jeans. He spent much of the day bouncing ideas of other colleagues while also reacting to and building on the ideas of the group. While his comments were imaginative and relevant, they were far from succinct and he didn’t seem bounded by the agenda. At the end of the session however, the room was buzzing with a handful of insights that this man had contributed to the group. His ability to think expansively, his long history working with and studying corporateinnovations and his confidence to think out loud while stumbling into the next great thought allowed him to add significant value. Some innovation teams neglect to set goals at the start of a project because the range of possible outcomes from the project are so extreme that they find it impossible to know what to shoot for. On the one hand, they don’t want to aim too high as they don’t want to fail but at the same time they don’t want to constrain themselves to only considering incremental opportunities. Even though it might seem to be a difficult exercise, teams that don’t have the discipline to set goals upfront are likely making a mistake. …painting an image of the future that the whole team buys into feeds the team’s hunger for success while also mitigating conflict. Starting off by establishing a vision of what the team is hoping to achieve is the first step. Dr. Kobus Neethling, President of the South African Creativity Foundation, notes that painting an image of the future that the whole team buys into feeds the team’s hunger for success while also mitigating conflict. “When team members are confident they are all striving for the same goal, interpersonal conflict is lessened,” because the only things they can disagree on will be how to achieve those goals. The high performing teams tend to revisit their goals periodically as “a way of reinforcing amongst themselves their commitment to the cause” according to Katzenbach. The metrics that work the best are ones that the team has co-created themselves as teams are more likely to be committed and accountable to goals that they have set for themselves. While some teams might set themselves lofty goals, such as “find $200MM of new revenues,” we believe that focusing on business outcomes too early in the process is a mistake. We agree with Liedtka’s recommendation in The Catalyst that getting an answer to a question might be a better goal to set. Innovation requires a number of applied experiments aimed at figuring out which new idea will work, and simply getting an answer—either yes this will work, or no, this will not work—is one measure of success. Disconfirming data is not to be considered a failure because cutting bait on bad ideas before you waste money and time, are vital for long term success of any organization that aims to grow. After spending time with successful entrepreneurs, we were struck by the stories they told about the high levels of motivation and focus they displayed at their peak. This level of commitment and engagement is hard to mimic in a large corporation, where members of innovation teams often work under less pressure. In fact, we’ve often been surprised to see members of corporate innovation teams going about their work in a “business as usual manner” in stark contrast to the approach of startup entrepreneurs whose passion often drives them to work long hours and make other personal sacrifices for the good of the business. Much of the innovation taking place in today’s world is happening because of entrepreneurs and if big corporations are going to keep up, mindsets and behaviors among innovation teams will need to change. Attempting to spur entrepreneurial motivation within a corporation might be possible by adjusting the compensation and rewards to provide more risk and more potential for financial rewards. If this is not feasible, perhaps team members could at least sign an “entrepreneurship contract” pledging their commitment to the business. Regardless of the potential monetary or other rewards, there is no doubt that for any innovation team to be successful, team members must be fully committed and not “one foot in, one foot out.” When looking at this aspect of motivation it is helpful to put on the hat of a venture capitalist to understand what characteristics are most important to them when they evaluate an innovation team. One recipient of venture funding from Updata partners was a digital marketing company called iContact. The CEO of the company, Ryan Allis started the company while a student at the University of North Carolina at Chapel Hill. After a short while, his young tech company started growing and performing smartly. Soon, Ryan was faced with a difficult decision: continue at UNC and finish his degree or leave to focus on his startup? For him, it was a no-brainer. Just like his role models, Michael Dell and Bill Gates, he knew that the right choice was to leave school so he could give his business the attention it deserved. Apparently he made the right choice. From its formation in 2003 to now, iContact has grown into a company with 210 employees and annual sales of $38 million. He was able to be successful in large part because he focused all of his time and energy on his business, instead of having his attention split several ways. For innovation teams in corporations, the same issue is present and often team members have their attention split across multiple responsibilities. For the team to be successful, team members must be allowed to fully focus on their innovation project, rather than being distracted by their other roles in the corporation. In summary, we believe that as long as big corporations continue to seek new ways to deliver organic growth, innovation teams will have a role to play. Companies that spend time upfront, thoughtfully assembling, managing and motivating their teams will likely have more success than those who pursue a “business as usual” approach. Great summary on things important in large and medium organizations when considering a shift to the dark side, the more innovative risky side, the fun, empowering, engaging and higher margin side of business. Good insights into this important area. I would add one more piece of advice – find some early wins that show the process is working and broadcast that success. Appoint a Devil’s Advocate in Group to show every possible threats of decision.. ! !